Since I have been getting many questions asking me "how do you potty train your parrot? ", I'm going to share how I potty trained my parrot without potty training my parrot. She hasn't pooped on me (at home, outings are a little tougher for other reasons) in as long as I can remember. In fact she doesn't even poop in her cage much anymore either. In the morning I let her out of the cage and she flies over to her potty stand and drops a big one. Then when I come home from work, I let her out again and she takes care of business. When I have her out, usually when she needs to poop she just flies back to her stand to do it. I'd say I have approximately a 95% success rate where Kili poops on a newspaper rather than some place else in the house. On the other hand, I do not worry about her "holding it in too long" as some people fear potty training does. So if I am away from home for a weekend, she just poops in her cage normally. All these people who claim to sell a secret technique or secret product for potty training are full of birdshit. First off, regardless of what I write here, there will be accidents. So you must be willing to be accepting and understanding of the fact that your bird may end up pooping on you, your clothes, furniture, rugs, carpet, etc. If you first accept the parrot pooping anywhere as a fact of life, then you will be able to take it easy and let the potty training methods prove useful. If you start the other way around and must have everything clean and expect potty training out of the parrot, I don't think it will work. With that said, I'll start by talking about prevention and cleaning prior to getting into the actual training. The first step is basic prevention. And I'm not going to talk about prevention by keeping your parrot caged or keeping it clipped because I don't believe that either is necessary in this potty dilemma. What I mean by prevention is putting rugs, mats, or newspapers down in prominent places that your parrot goes. This is most obvious to put something under play gyms, perches, cages, and areas the parrot frequents. Personally, I put rugs under my parrot's cage, play tree, and training area not only for poop but also seeds and other mess because I don't want the frequent vacuuming to wear out the carpet in those areas. I also put newspapers on the rugs underneath the training perches and climbing tree. By using rugs, mats, and newspapers, you can rid yourself of worry that your floor will be permanently damaged in any way. By alleviating the worry, you can let the parrot poop on the rugs and places and work on eliminating it at the parrot's pace. The good news is that parrot poop is generally easy to clean up. Some parrots (cockatiels and budgies from personal experience) have very dry poop that comes out like an entire nugget and can easily be picked up with a little piece of paper towel. Other parrots have wetter poop and it may require a moist paper towel or rag to clean out of a rug but can be easily wiped off from a hard floor or table. Good news is that parrot poop isn't smelly and very water soluble. If you keep rubbing with a wet paper towel or rag, it will come out of clothes, rugs, carpets, etc. I barely ever have these accidents any more but it can still happen on occasion. Be sure to keep some carpet cleaner or poop off sprays handy if you have such surfaces. The good news about using rugs is that you can vacuum seeds/crumbs out of them easily and you can throw them out if they get too dirty. There are some really cheap rugs out there which are essentially a cut piece of carpet and at the price they are, you can afford to replace them every year if you have to. Now let's take a look a little bit at parrot anatomy to realize what makes them tick (or poop so often rather). First off, birds run a hotter/faster metabolism than terrestrial animals because they need the high concentration of energy for flight. So in order to keep that running they need a constant supply of food. However, some days they cannot eat because of weather and obviously they have to get through the night and parts of the day when they do not eat. Birds don't have hands to carry food around with them so instead they eat a lot and store the food in their crop for slow release into their digestive system later on. Someone asked me if you only have to be concerned about a parrot pooping frequently after eating but my answer is that they poop at a fairly consistent interval all day long because they are processing food from the crop many hours after eating. The second thing is that birds poop far more frequently than most terrestrial animals. I think there are two major reasons for this. One is to save weight for flight. While the slight addition in weight from holding it in isn't a big deal for a land animal, for the bird it means less energy required to fly. Secondly, for birds the poop and pee come out together. Since they are metabolizing food all day long coming in from their crop, they develop metabolic wastes that need to be cleared out. So for these reasons, you will probably find that your parrot poops anywhere from every 5 - 30 minutes at a fairly consistent interval. It varies from species to species so I cannot tell you what timing you can expect but over time you will get to learn your parrot's rhythm and learn to follow it to avoid getting pooped on. I think my Senegal Parrot poops every 10-15 minutes when out but I never bothered timing it. The idea is to put the parrot down on the perch (with newspaper underneath) to poop just before it has to poop. Over time you just learn when to expect your parrot to poop. If you end up getting pooped on, you learn to put them down sooner. Let's say the parrot typically poops every 15 minutes. You take the parrot out of the cage and put it on its perch. You leave it there until it poops. Then you can pick the bird up and handle it for 10 minutes safely and not worry about poop. Then after 10 minutes you put it down on the perch, wait 5, then take it up again. Over time you will learn to optimize your timing so you can get more time out of your bird and the bird will also learn to hold it a little bit (if you're late) to poop from the perch. That's it! That's the big secret. I didn't use any formal training for Kili. She just learned over time from routine to poop from her perch and not on me. She learned that when I put her down on the stand, the sooner she poops, the sooner I will take her back and go back to spending time with her. Remember how I said to put them down on the perch 5 minutes prior to expected poop? Well once they are potty trained, you can hold the bird away from stand for 15-25 minutes and they will hold it in and when you put them down on stand they will drop it immediately so you can go back to doing fun stuff together. The bird just becomes accustomed to the site of the stand every time it poops because you always put it there prior to it pooping, so it becomes learned through habituation. Some of the potty training guides suggest giving a command to poop but I find that pretty useless. I usually hold my parrot longer than typical poop schedule so by the time I send her to a perch, she just poops immediately. So being placed or flown to a perch becomes the cue to poop for the bird and only if it needs to. I think this method is very simple and safe to use because there is no requirement for the bird to poop or not poop. It just learns that the stand is the place to poop merely because every time it pooped before it happened to be on the stand (because you always put it there using the timing method). I don't see any point to holding the parrot over the toilet to poop or any of the other weird methods out there. I just suggest setting up a perch with newspaper underneath it that you can quickly place the parrot on whenever you need it to poop. If your parrot is flighted, then all you have to do is teach it return to perch flights and just let it fly back to the stand to poop. 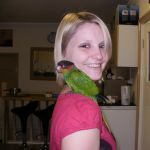 So in fact, it's the clipped-parrot people who are at a disadvantage here rather than the flighted-parrot folks. Yeah, I know you clippers thought that by clipping your parrot, you would avoid having it fly around and poop all over but in fact it works the other way around! The clipped parrot is stuck on you if you are holding it and it needs to poop so it will just poop but the flighted parrot can fly back to its perch when it has to go. So let me summarize this all up once again in my conclusion. Start by having some good poop prevention measures so that you don't get too upset if the parrot poops somewhere it's not supposed to. Wear old clothes, put down rugs, newspapers, etc wherever the parrot spends a lot of time. Set up a perch with newspaper underneath to be the potty perch (this can be a normal perch the parrot spends time on but just for the sake of habit use the same place every time). Get a feel for how frequently your parrot poops and use the timing method to replace it on the perch just before you expect it to poop. Whenever the parrot has pooped on the stand, go and pick it up or recall it to you immediately and go back to spending time with it. Repeat the process every time the parrot is out (whether or not you get successful potty training because even by itself the timing method is very effective). Then just give it a lot of time and you will notice the parrot pooping less and less where you don't want and more and more where you want it to. Part of it will be from the parrot becoming accustomed to poop on the potty stand. The other part of it will be that you'll be so tired from cleaning parrot poop that you will learn to keep up with that poop timing much better! I hope this helps anyone who wanted to know how I potty trained Kili because I didn't. It just happened by using the prevention and timing methods as I mentioned and lot of routine and habit. The message I hope this article sends people is that clipping your parrot to avoid poop in unwanted places should no longer be your concern because if you use these techniques, the parrot will poop in the same place most of the time anyway and the flight will not interfere but rather help ensure that it can poop in that place because it can get there whenever it needs to. Here's a video showing how I let Kili out of her cage and then she flies over to her perch to poop. Then we go about doing some morning things together like weighing her and getting her food out. I'll just add that Scooter, who is clipped, also rarely poops on me anymore, and I've only had him a few months. He has learned that if he does poop on me, I'll put him in his cage or on his playstand while I clean up, and he'd rather be with me. I also have made a point of picking him back up after he's done his business. As a result, he now politely relieves himself before he steps up out of the cage, and if I give him half a chance, he holds it until I put him in his cage or playstand. Of course if I forget and go walking around with him on my shoulder indefinitely, poop happens, but he'll even try to warn me by getting my attention when he's starting to need to go, and it is pretty easy to tell by observing that that's what's on his mind. My Grey is not really potty trained but she poops on command. I have to make sure to make her step up to poop when she is on my shoulder otherwise I'd have a messy back. I never really trained my Coto either. If she is on my shoulder she will get my attention by biting my shirt or crawling down my arm. While she is not clipped, she doesn't have a great flying ability so sometimes she can't make it back to her perch in time. Today she headed for the kitchen floor. Smart birdie! Ah, yes, potty training! Fantastic! My 'too is very well potty trained. If he's on me, he'll jump down to the floor, walk to his cage, climb up, poop, climb down, and come back. First, I got him potty trained so that he would only go in his cage (he doesn't like perches). Once he got that down (telling me "You wanna go to bed?" when he has to go), I started putting him on the floor when he told me he had to go and he would walk to his cage. He eventually just started doing it automatically. Sometimes he flies, too. I just keep his wings clipped if I have to take him somewhere. Mork, who is still just 7-8 months old, is also well potty trained already. We did the same thing with him as entrancedbymyGCC did. He would go on the floor or on our clothes, and we would say "cage" and put him back in his cage. Eventually, we noticed him pooping before he would step up out of his cage. And now, he will hold it while we have him out, and we just bring him to his cage or stand, and he'll go, and we'll pick him back up and praise him. If we forget to give him that time, though, he will eventually poop. We're trying to teach him to tell us when he needs to go now. It's hard to tell with him--he doesn't have very clear body signals like Goffie. I doubt you can ever get 100% but if you can keep it to the point where you aren't cleaning bird poop out of random places every day, then it is totally worth it. Even when potty trained, it's still your responsibility to send or put them on a perch every so often to give them a chance to go if they need to. Mine have been taught to poop when they land on their perch so I simply send them to their perch to see if they are gonna go or not. I am trying to use this method now, and its working such good advice on here. Since I don't yet have a training perch and Bucky isn't flying yet, our variation is to put him on some newspaper on the floor every 10-15 minutes and tell him to "go poop." Unfortunately, I kept losing track of time, so I set a timer on my iPhone to 'Quack' every 12 minutes reminding me to put him down and do his business (always with the verbal cue). After a couple of days, he became very reliable about going as soon as I put him down so I would pick him back up. The funniest thing happened though. We were visiting JJ at the breeders and I noticed Bucky making a funny sound I hadn't heard before - then he poo'd on my shoulder. About ten minutes later I heard him making the same sound. Just in time to avoid another 'oops' on my shoulder, I realized he was quacking at me to tell me he needed to go! The bird is smarter than I am! What a good boy!